I was scanning some old photos recently and found this image, bent and crumpled a little like the characters are now. 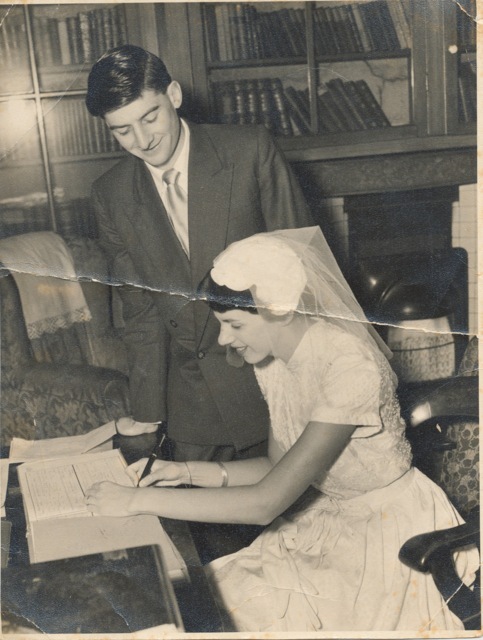 My parents signing the Marriage Register in London, away from their Australian families whilst they studied and worked. Coincidentally yesterday was their 59th wedding anniversary. Always generous, my father celebrated by taking my mother, a granddaughter and me to his favourite restaurant. Looking across the table at two very contented people prompted me to wonder what contributes towards making an enduring relationship. Do examples in society around a young couple contribute to their attitude towards creating a strong and healthy marriage? Perhaps for my parents’ generation who wouldn’t have seen many of their parents being divorced but their example didn’t work for my sisters and me. What hope is there for my children when the average marriage lasts about 8.7 years? The familiar saying that ‘differences attract’ might have some truth but only if those differences are not so strong that they prevent the couple from sharing experiences. How more different are the backgrounds of my father, whose parents emigrated from Italy in 1922 with very little money and limited English and my mother, a 5th generation Australian whose family was financially secure. Yet they found their similarities to be so attractive that despite misgivings amongst their friends, ‘Marry him, but don’t drive with him,’ was proffered by a friend, they plunged into a marriage that has endured for 59 years. Neither of my parents can really define why it has worked so well, perhaps it seemed like a good idea at the time. When I listen to their gentle bickering over a wrong bid at Bridge I wonder whether it is their competitive spirits that so attracted them? Perhaps when as in every relationship things were not working out, their determination to succeed made them persist with the marriage rather than give up on it. As my mother used to say, ‘You may not come first in every race you swim, but you can certainly try.’ Doing as well as you could at what you set out to do was an integral aspect of my parents’ lives whether it was marriage, academia or sport. Despite being in his late 80’s my father enjoys playing Golf with his mates and was hugely excited when he recently scored a Hole in One. I remember my first husband refusing to make the children’s sandwiches because it was ‘women’s work’. Equity in marital roles wasn’t even considered when my parents married but despite quickly slipping into the traditional roles of major income earner for my father and Domestic CEO for my mother, rarely did they criticise the other’s intellect. Supremely self-confident, they become excited with new ideas, new products and places. Rather than sit on an Australian beach at Christmas they will go to Lamu in Kenya. Never have they considered that they cannot achieve what they set out to do. My father raised us with the philosophy, ‘Be anything other than boring’. Now he is constantly challenged by his iPad and how to do Internet banking overseas. I have seen my father shake his head over the amount of money my mother spends and her reply that she makes him happy so just pay up. They have shouted and yelled at each other but never kept a grudge. They have looked after each other and laughed often. They don’t always share the other’s interest in sport or art but are willing to participate. Although sometimes critical of the other, it is not used as a destructive weapon. Irritation at the other’s independence that can seem like neglect has not been allowed to grow into an obstacle. They can almost predict how the other will behave and think in most situations. Over many decades they have managed to maintain pleasure in each other’s company and a joy in making the other one happy. Even after 59 years of marriage my father knows just what jewellery will delight my mother. What did she give him? Her smile. This entry was posted in Families, Marriage and tagged Marriage on February 12, 2014 by lorikeetlady.